Sure, the DS is choked with cute platformers -- we all already know that. Still, when I hear that a game is coming our way that not appeal to my retro sensibilities, but also is being headed up by the same folks who took the lead on the excellent Henry Hatsworth and the Puzzling Adventure, I tend to take note. As that is the case with Monster Tale, an upcoming title from Majesco, we thought it might be worth checking out. Okay, so you're a little girl with a monster pal who must go on a great adventure. We've done that before, right? But why should we do it again? Well, I'll tell you. Hit the jump to hear more on why this little game just may have you glued to your DS longer than you might think. The first thing I noticed about Monster Tale -- and the thing that you likely won't be able to help noticing either -- is that it feels so much like playing something on your Super Nintendo, it's not even funny. For that alone, I love Majesco for this. Not everything retro-flavored is good ... but if it's done right, it can be wonderful. When Monster Tale opens, you'll meet Ellie, the blue-haired girl you are going to play. 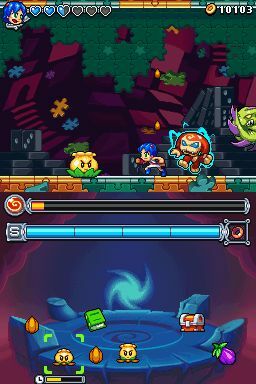 Ellie finds herself in a mysterious world with an adorable creature named Chomp who follows her around and just so happens to be willing to assist her during battle. This is where your adventure begins ... and while it's not exactly a unique premise, it does give the developers the opportunity to put some really fun game mechanics into play. The second thing you are going to notice about Monster Tale right off the bat is that its map system works like Castlevania's does in the more recent DS titles. By no means is this a bad thing, either. After Chomp's introduction, you'll be gently eased into the ways he can be used. I especially appreciated the speed at which we are introduced to new mechanics here -- it does a wonderful job of explaining without making the user feel talked down to or left in the dark. 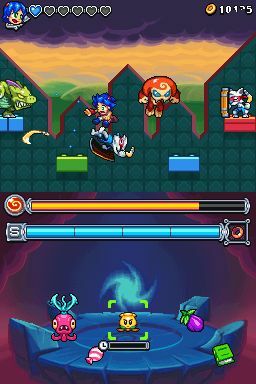 As shown in the screenshot above, both screens are cleverly implemented by dedicating the bottom screen to something called Chomp's "Pet Sanctuary". The little critter can swoop down there to regain health, eat powerups you find ("pet items"), and learn new skills by reading scrolls. 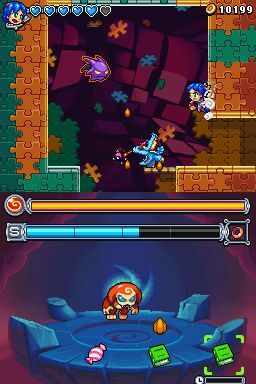 It keeps you busy and dices up the sidescrolling part of the adventure, but never feels like a chore. Monster Tale also manages to pull off another challenging feat in being cute without being annoyingly so. It is not as difficult as the sidescrollers it seems to be inspired by, but remains challenging enough to be worth playing. As Chomp develops, you can carefully customize him by using the money you find on weapons, powerups and more, so his performance is really what you make it. You'll want to choose wisely too, because there are lots of epic bosses coming that you'll need to be ready for! Monster Tale comes out this March for the Nintendo DS and will retail for $29.99. If you want some quality gaming time reliving the joy of your 16 bit days, you just might to check this one out!